Wilderness at risk: Colville Forest Plan falls flat on wilderness recommendations. The revised Plan recommends wilderness protections for only three areas, leaving most quality lands without permanent protection. Last week, the Colville National Forest released its Revised Forest Plan after 15 years of work to update the guidelines by which our public lands are managed for wilderness, wildlife, recreation, forestry, and other values. Despite strong local support for more wilderness and vast areas of qualifying pristine wild country, the Revised Plan recommends wilderness protections for only three areas, leaving most quality lands without permanent protection. This is disappointing. The Forest contains more than 220,000 acres of wilderness-quality lands but less than three percent is currently officially designated Wilderness, the smallest amount of any National Forest in the Pacific Northwest! Most notable is the absence of wilderness protections for the vast tracts of wild country in the Kettle River Mountain Range. The Forest’s analysis of the Kettle Range’s undeveloped roadless areas gave the Profanity Peak, Bald Snow, Hoodoo, and Thirteenmile roadless areas high ratings in several key criteria. All provide outstanding opportunities for wilderness recreation, including day hiking, backpacking, hunting, backcountry skiing and snowshoeing, horseback riding, and wildlife viewing; all are within an easy day’s drive from the greater Spokane area. These areas provide the wild, scenic backdrop for the region’s many scenic driving routes and communities that promote the rustic, remote backcountry as part of a growing recreation and tourism economy in northeast Washington. Check out our map of Colville National Forest roadless areas! A map of roadless areas and wilderness-quality lands on the Colville National Forest in northeast Washingtons Columbia Highlands. Map: Amelia Tiedamann. Click here for larger version. The Revised Forest Plan recommends wilderness for fewer than 62,000 acres across northeast Washington, mostly in the Selkirk Mountains adjacent to the existing Salmo-Priest Wilderness Area and for Abercrombie-Hooknose. In the Kettle Range, only portions of Bald Snow were recommended for wilderness. That’s far less than needed to meet demand and a substantial decline from the Forest’s 2011 recommendation for more than 100,000 acres. The Forest has left out a substantial amount of quality and qualifying land for wildlife and recreation. But it’s not just wilderness that’s at stake, the plan revision is the opportunity to implement forest wide guidance for many of the other issues that are core to our mission: old growth and roadless protections, road density guidelines, aquatic conservation and restoration, habitat connectivity and wildlife viability, among many other things. For example, during our review of the Draft Revision in 2016, we determined that it included no explicit protections for large and old trees and only aspirations for restoring large tree habitat across the landscape. In addition, the Forest’s proposed aquatic standards failed to prevent additional degradation, at a time when habitat conditions and fish populations, including bull trout, are doing poorly in most watersheds. It does appear the Revised Forest Plan has retained explicit road density guidelines and now allows wildland fire to be used as a tool across the entire forest—that’s welcome news. You can find out more information about the plan by visiting the Colville National Forest’s website. 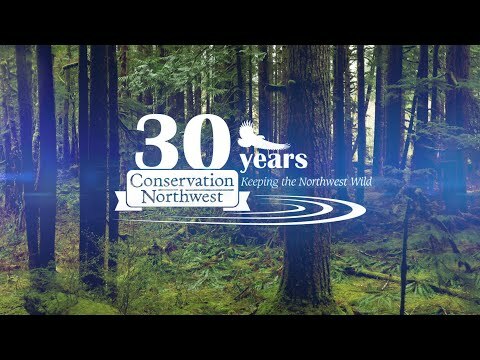 Stay tuned as we investigate how the Revised Plan addresses wildlife and habitat conservation issues that are vital to keeping the Northwest Wild. Learn more about work to better connect the North Cascades with the Rocky Mountains through wilderness protection and other conservation efforts in northeast Washington’s Columbia Highlands.